We're proud of what we've achieved. 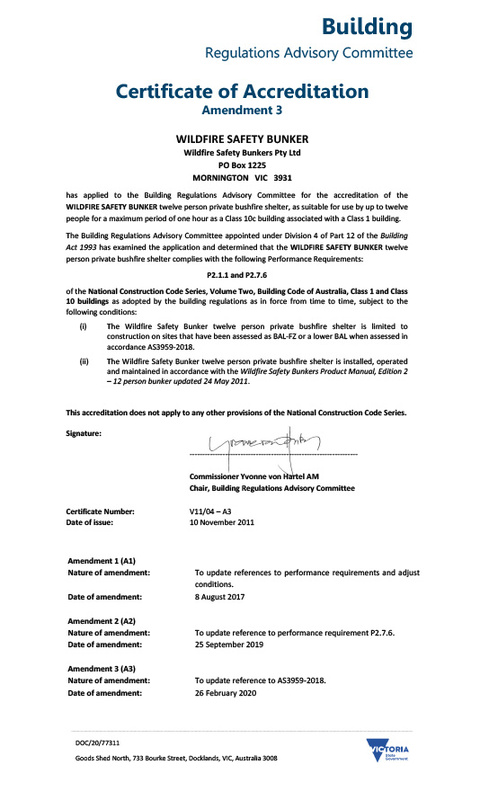 The Victorian Building Authority's Certificate of Accreditation proves our products have been individually assessed as complying with the performance requirements for use on sites classified up to 'Bushfire Attack Level - Flame Zone (BAL-FZ), the highest bushfire risk level under the relevant Australian Standard. It shows that our product meets the stringent official Victorian fire rating and engineering standards. Wildfire Safety Bunkers is currently the only personal bushfire shelter that holds this type of accreditation from BRAC-Vic. WSB’s private use bushfire shelter was accredited by the Victorian BRAC (Building Regulatory Advisory Committee) on the 4th of March 2010. 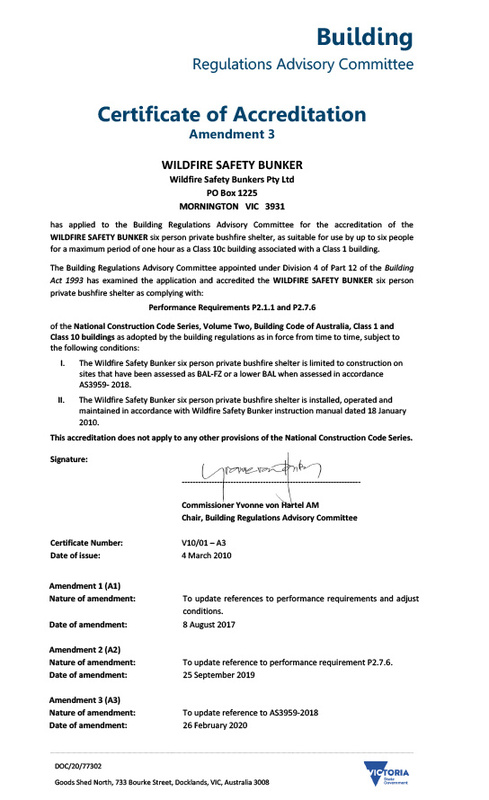 While there are currently no specific Government accreditation processes for wildfire safety shelters in other States and Territories or Federally, subject to obtaining local planning approval, the performance characteristics of the WSB mean it is suitable for use in all Australian State & Territories. Click on the thumbs to see larger versions. Does it again in 2016! the Hon. 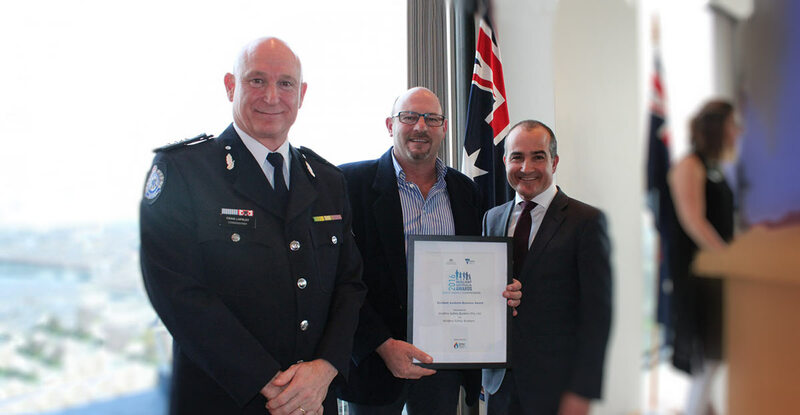 James Merlino present the award. 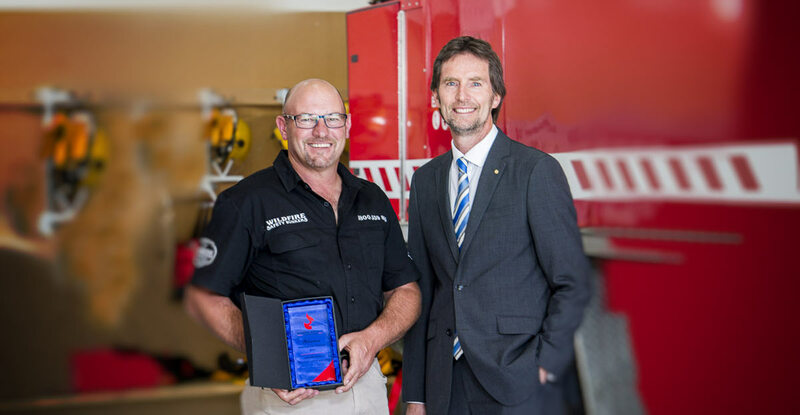 The Resilient Australia Awards is a national program to recognise and promote initiatives which strengthen community disaster resilience across the nation, making our communities safer, stronger, more resilient and better prepared to manage any emergency situation. 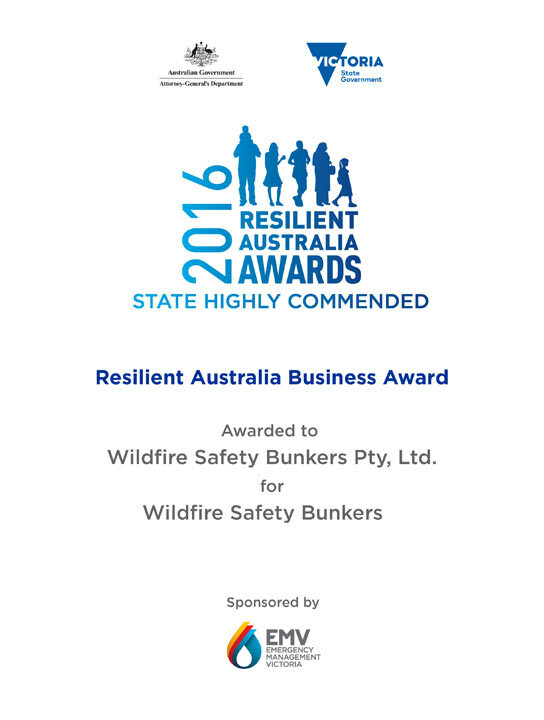 Wildfire Safety Bunkers was fortunate to take out the "Highly Commended" 2016 Resilient Australia Business Award, proving our products are of a superior quality. 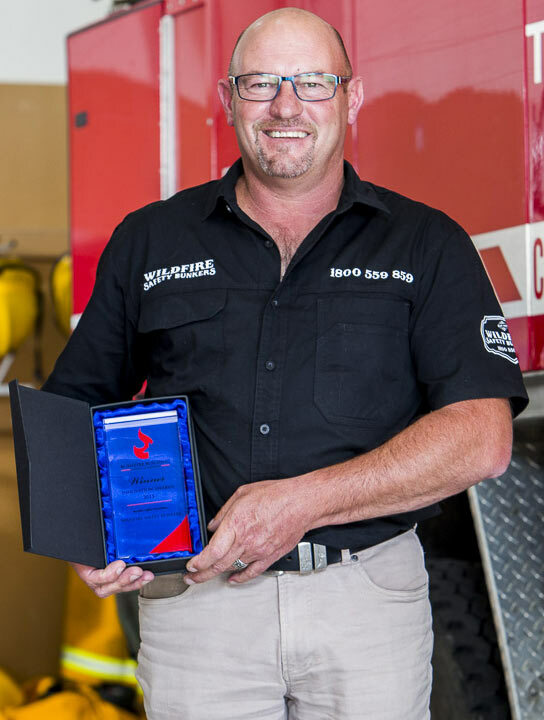 Wildfire Safety Bunkers Pty Ltd receives the 2015 Innovation Award from the Bushfire Building Council of Australia. 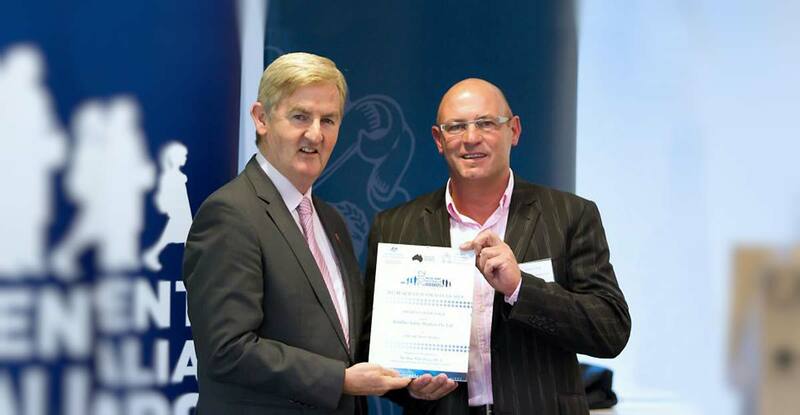 Managing Director Anthony Tratt was presented the award by Stephen Kip at the new Blackwood CFA station. 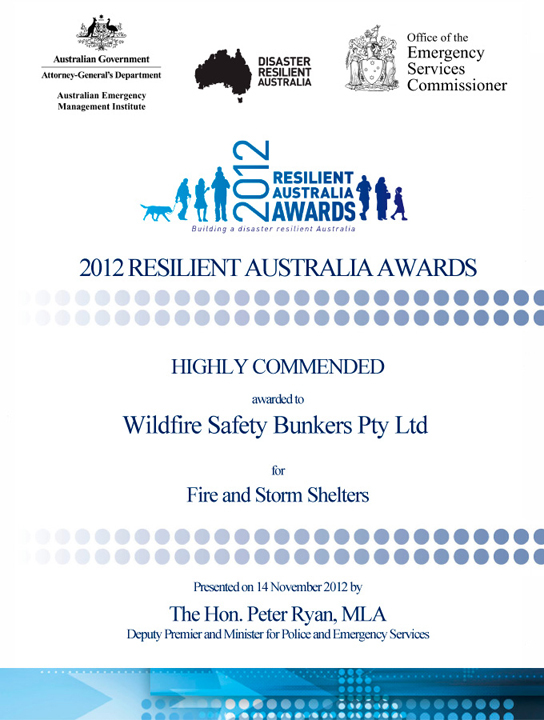 Wildfire Safety Bunkers was fortunate to take out the "Highly Commended" 2012 Resilient Australia Award for Fire and Storm Shelters, proving our products are of a superior quality.